I read 178 books in 2011; that's an increase of 13 books over 2010. Ten of those books were translated from other languages, and eight were eBooks, since I received a Nook Color as a Christmas gift. These eyes perused 54,588 pages of words and had a blast doing so. I'm also creeping up on my goal of reading 200 books in a year. I thought I would show you that I do occasionally read other books besides mysteries, although you can see that the other genres are barely a blip on the screen. One category that didn't even show up in 2010 is Short Stories. Since crime fiction is "my thing," here's the breakdown of the various subgenres that I read in 2011. The two that showed the largest increases over 2010 were Cozies and Thrillers. In 2009 I read mostly male authors and thought I should make a point of reading more female authors. According to 2010 figures, the number of male authors I read this year stayed very much the same, while I read twelve more female authors than I did in the previous year. I would like to see this even out a bit, but it's not something that I'm purposely setting out to change. I did read a total of 86 new-to-me authors, though! Since I'm an armchair traveler, I'm always interested in tracking the settings of the books I read. Compared to 2010, the continents of Australia, Europe and Asia showed little change. I spent less time in South America, and more time in North America and Africa. The European country I was most at home in? England, with a total of 34 books. The state here in the U.S. in which I was most at home? California, with a total of 19 books. New York had the largest increase, due to some cozy authors who've become favorites. I would like to see myself reading less in the United States and more in other countries in 2012! And here, of course, are the statistics for the book ratings I gave throughout the year. Compared to 2010, the A+ and A categories remained relatively unchanged, but the rest increased a bit. I didn't review any of the books I didn't finish this year. For the most part, I just wasn't in the mood for them. "Did Not Finish" normally means "bad," so I didn't think it was fair to the books or their authors that I publicly put that label on them. That's my breakdown of my reading year of 2011. Now it's time to go out and about to see how everyone else's year went! Love your stats! Sure shows how much you love crime fiction. Have a happy New Year and happy reading in 2012. Cathy - Wow! You put me to shame! You've done so much reading this year, and what a variety. Thanks for taking the time to do this. Whoops! Sorry! Forgot to wish you a very Happy New Year! I'm amazed at how many books you read in 2011. I'm well under 100 which was my goal but I guess that isn't too bad considering my life situation. At least I didn't have any DNFs in 2011; I actually enjoyed most of the books I read. I love all of your statistics! I'm going to try to keep better stats this year! Well maybe some of this will rub off on me!! (By osmosis from just reading your blog!) A girl's gotta wish for somethin, right? I really do think it's cool to look back at data from our year. It really helps me be more purposeful when I want to...to make changes or see myself grow. On the other hand, don't you just love the times when a chance decision leads to a great book?!?! Thanks for all the books you lead me to. Kaye-- Is it that obvious? 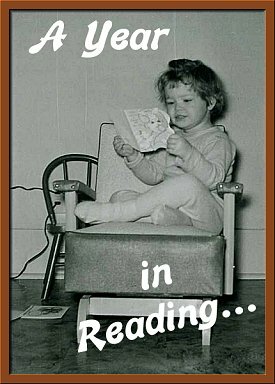 LOL Happy Reading to you, too! Margot-- You're welcome, and Happy New Year! Barbara-- And I enjoyed most of the books I read! Kathy-- Once you get into the habit, it's easy! IAB-- 77 makes it very easy! Lovely statistics - such a nice and simple way to get an overview. And Happy New Year, Cathy! Snap - we read the exact same number of books! I love this time of year and seeing everyone's statistics and charts, yours are excellent and provide a great look at your reading. Thanks for sharing. Dorte-- I'm glad you like it. Happy New Year! Bernadette-- Wow, reading the exact same number of books is very unusual. We couldn't've done that if we tried! Happy New Year! What a fun way to look back at the year! Is there somewhere on your blog to get a list of those 21 A+ titles? Are they the same as the 19 books "best of 2011"? Debbie-- They're the same as the "Best of 2011", although I did notice that I got distracted and didn't list two of the titles on that page. When things settle down, I'll rectify the oversight. I've made similar graphics, but have't counted gender and countries,I know many bloggers do. I never really thought that it mattered before, but i think I'll start collecting that information in 2012. Alex-- I know that I've added a category or two over the years as I've seen them on other bloggers' lists and thought them interesting. Love looking at your break down! How fun to see everything in graph form. Kris-- I think it soaks in a bit more when you see the info in graphs. At least that's how my brain works!